Sandi Allison gets ready to cut the cake at her March 13 retirement party at Frost Manor. 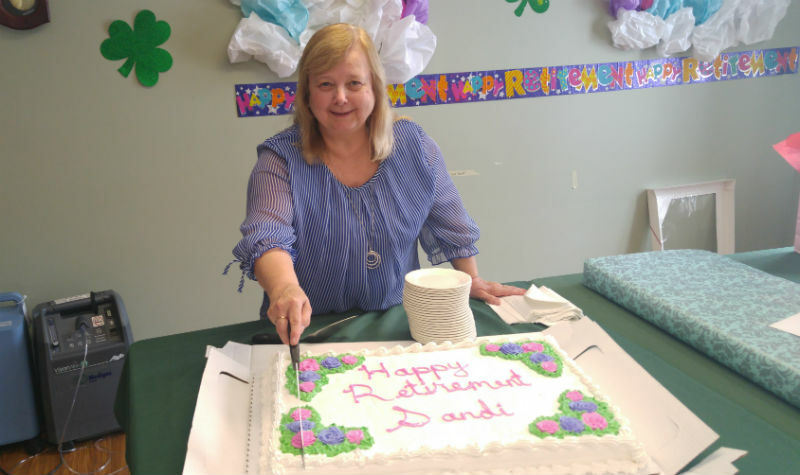 Sandi recently retired after serving as the Lindsay long-term care home’s office manager for 14 years. LINDSAY, Ont. – There were tears and laughter at Frost Manor on March 13 as staff members shared their memories of working with office manager Sandi Allison who recently retired after serving the Lindsay long-term care home for 14 years. About 40 people, including residents, family members and staff, gathered in the home’s activity room during Sandi’s party. Frost Manor team members stepped up to the podium to wish Sandi well in her retirement and to share some of their favourite moments working with her. As Frost Manor’s office manager, Sandi played a crucial role making sure the home’s trains were always running on time. She also worked closely with the home’s personal support workers (PSWs) when it came to scheduling. PSW Wanda Junkin characterized Sandi as being a patient team member who worked well with front-line staff members. “I know the PSWs here really appreciate you for all your hard work, and I am personally going to miss all your smiles and giggles,” Wanda told Sandi. Phyllis Smith, who works in Frost Manor’s laundry department, told Sandi her presence at Frost Manor has already been missed since her last day on the job two weeks ago. “We thank you very much for all your patience and your expertise, and we are all going to miss you and we wish you the very best,” said Phyllis, who has worked at Frost Manor for 38 years. Of course, there were gifts for Sandi from her colleagues and OMNI Health Care head office, as well as a “retirement cake” for Sandi to cut. There were also some familiar faces who dropped by Frost Manor to send Sandi their wishes. Former administrator Connie Abrams and former life enrichment co-ordinator Vi O’Leary, who both retired in 2018, stopped by to pay tribute to Sandi.